Alec Herzer, who was not able to be present, with a photo of his wife Elisabeth October 21st 1970 is a very special date for the 777 couples around the world. Our blessing was the first international blessing with 10 countries taking part. So this year marks the 40th anniversary of our blessing in Korea. 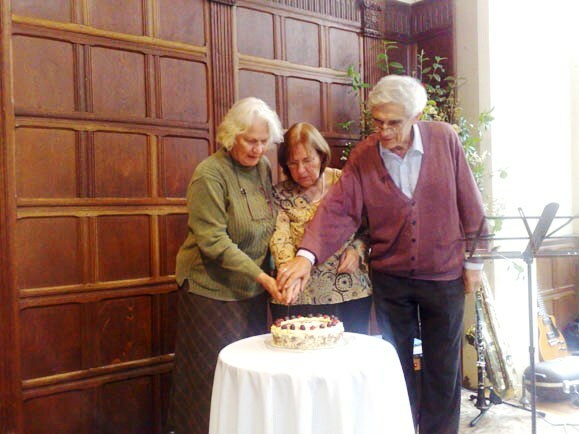 Alec Herzer, June Darby and Carlo and Barbara Zaccarelli decided to mark the event by a celebration in Cleeve House and to invite family, friends and some representative couples to join them. Cleeve House has now become popular as a wedding venue and sometimes used for wedding anniversaries too. Miriam Zaccarelli often does special flower arrangements for the weddings using greenery from the garden, so for this occasion she made lovely arrangement with ruby red flowers. The format for weddings is usually drinks and canapés on arrival followed by a meal and entertainment. We set up the Hall with round tables and a small stage and began the event by inviting our guests to a glass of Shloer in the library. We then dined on an Italian lunch followed by a selection of delicious homemade cakes and desserts brought by the guests. There was also the cutting of a special celebration cake made by Ingrid Davies. Simon Cooper and Jack Corley sent greetings to the couples and Carlo expressed gratitude for the moment in which we live. He said the vision we had 40 years ago is still the same. When he went to the blessing there were only 4 other members in the Italian movement and 12 in England. Today we saw three generations in the room. R. Zaccarelli was the MC for the entertainment provided by our talented guests. It felt like a cabaret, with warm applause and opportunities for audience participation. It truly was a memorable afternoon and we would like to thank everyone who shared this occasion with us as well as those who sent us greetings.